About the only thing I can remember about the 4th year of my life was the night my sister HAD to watch some ridiculous TV show call The Ed Sullivan Show. All she talked about for days (and years after) was The Beatles. Yes, on this date in 1964 we were part of the record 73 million viewers that saw The Beatles make their first U.S. Appearance on Ed's show. The rest, as they say, is Beatlemania History. After that night, teenage boys began boycotting barbers as teenage girls plastered their walls with the "Fab Four." Daughters were wearing out all the needles on their phonographs that their dads weren't breaking because, after all, “Pop Hates the Beatles” (a rare reference that perhaps only Sir John of Rosedale will get). Now, how do I tie this in with the Knights of Moleskine, Spirit, and Ale? The Beatles were Great writers, artists, and thinkers. Obvious. Merry. These four lads from Liverpool came to America armed with good cheer and wit. In 1987 EMI Parlophone in the UK put together a promotion with Heineken Beer, unusual for the fact that the Beatles have rarely loaned their name for advertising purposes. Specially printed cans of Heineken Beer featured a red banner across the top that said "The Beatles - A Unique Cassette." Along the bottom, the Beatles' names repeatedly circled the entire can. By sending in four pull tabs from the cans and approximately $5.00, consumers received a special custom pressing of a unique EMI compilation cassette titled Only The Beatles (Parlophone SMMC 151). The tape featured twelve songs from 1962-1967, including "previously unreleased stereo" versions of This Boy and Yes It Is. This is the first and only time that a special pressing of Beatles songs was ever issued for the promotion of a commercial product. The cassette, along with the original can and inserts, is very hard to find as a set and is now worth from $150-200.00. Only 4? I thought it was just 17, if you know what I mean? OK, I admit, I was almost 8! Too bad I didn't drink beer back then, though I do have the tracks from Hamburg stored on my iPod. 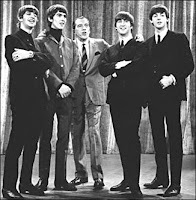 I remember watching them live on the Ed Sullivan show. I immediately informed my parents that I wanted my hair to touch my collar and a pair of Beatle Boots! Of course I didn't get anything but a no way stare! That's when I could identify with No Where Man and Baby You Can Drive My whatever the hell out of here. Even at that tender young age I was a rebel of the 60's! And in the end that's why I make love as much as possible because I found out you can't Buy Me Love!